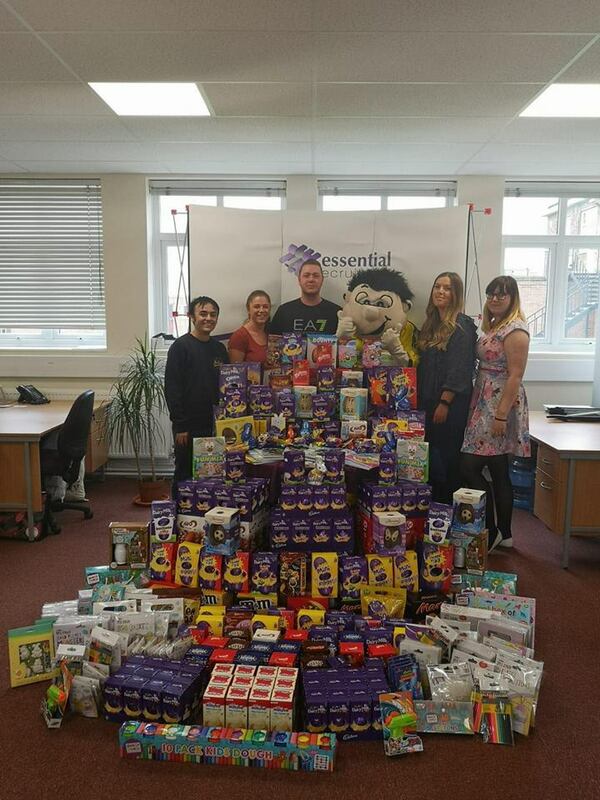 Essential Recruitment have ran their Easter Eggstravagansa for the 4th year running! Our office, based in Bretby Business Park, has worked with local companies to bring together a collection of chocolate eggs and craft materials to donate to local charities and hospices. In total we received around 500 eggs! Billy Brewer, the Burton Albion Football Club mascot even dropped by to celebrate with us! The eggs are to be donated to three charities around the Burton area; Harvey Girls, who provide support for families in the burton area who are going through a rough time, CVS in Swadlincote, providers of free emergency food parcels to families and individuals in the South Derbyshire area and Rainbows Hospice in Loughborough, who provide a care and assistance service for family who’s children are terminally ill.
Every year, this project helps to connect us to the local community and to help those in less fortunate situations enjoy the festivities. Due to it’s continued success, we see every reason to continue this scheme in the future. Thanks again to everyone who contributed!